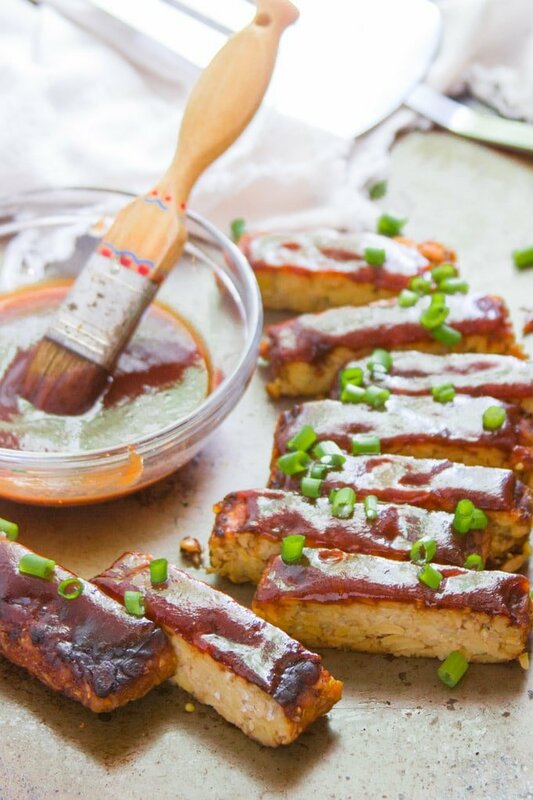 Smoky, savory, and slathered in sweet and zippy homemade barbecue sauce, these vegan ribs are made from tempeh! Cook them in the oven or on the grill for a meatless summer feast! Here’s something funny: I didn’t know what “ribs” were until I was twenty one. I knew they were some type of meat that I wasn’t interested in, but that was about it. And then I got a job waiting tables at a restaurant specializing in prime rib. (I was a long time vegetarian by then, in case you were wondering.) I thought what I was serving was the same thing as spare ribs, until a customer corrected me. Oops! So yeah, that’s how I learned what ribs are. Hopefully that little tale hasn’t destroyed my credibility. Assuming not, how about some vegan ribs from a girl that’s never had a non-vegan rib?! Whether or not these taste anything like non-vegan ribs (my husband says they do), I promise they’re really good. I saw a video on Facebook (and then totally lost track of it) about a restaurant that was selling vegan ribs made from tempeh. Since I have no idea where that place is and I’ll probably never get to try their tempeh ribs, I decided to make my own. First, you braise the tempeh in a smoky, savory broth. I got the idea for that from this tempeh cutlet recipe, which I made, and it was great. For my ribs you’ll braise the whole block of tempeh in one piece! Then you’ll pan-fry it in a little bit of oil to get it crisp. While the tempeh cooks, simmer up some barbecue sauce, then slather it all over your tempeh. I baked my ribs because I’ve yet to open the barbecue grill for the season, but you could grill yours if you like. Feel free to use your favorite vegan bottled barbecue sauce if you don’t feel like making your own. One of the awesome things about this dish is it’s portability. If you’re headed to a cookout, follow the recipe up to the step of slathering the tempeh with barbecue sauce. 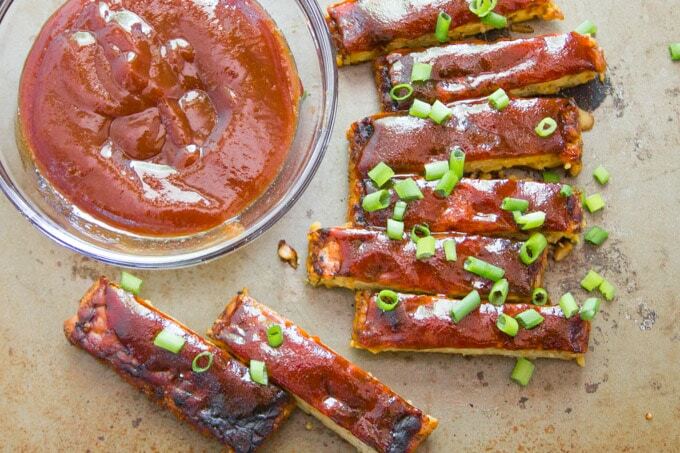 Take the tempeh and sauce with you, and when you’re ready, slather and grill your tempeh ribs. You can see from the photos that I used a cast iron skillet to braise my tempeh. I only recommend doing this if your skillet is really well seasoned. Otherwise, stick with a non-stick frying pan or saucepan. If you find the taste of tempeh off-putting, try steaming it first! You can do this by placing the block in a steamer fitted over a saucepan and steaming it for 10 minutes. Or use my shortcut: wrap it in wet paper towels, stick in on a plate, and microwave for 3-4 minutes. You can skip the pan-frying step if you eat an oil-free diet. Your tempeh won’t have as much of a crispy coating, but it will still be delicious. 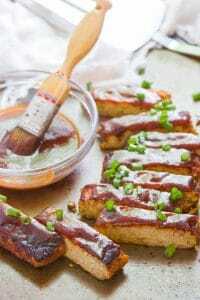 Smoky, savory, and slathered in sweet and zippy homemade barbecue sauce, these barbecue ribs are made from tempeh! Cook them in the oven or on the grill for a meatless summer feast! Stir the water, soy sauce, maple syrup, paprika, onion powder, and garlic powder together in a small bowl. Place the entire block of tempeh into a medium skillet or saucepan, and pour the soy sauce mixture over the tempeh. Place the pan over medium heat and bring the liquid to a simmer. Allow the liquid to simmer for about 5 minutes, flip the tempeh, and then allow it to simmer for another 5 minutes. Spoon some liquid over the tempeh every so often while cooking, and add water to the pan if the liquid dries up before 10 minutes is up. While the tempeh cooks, combine all of the barbecue sauce ingredients together in a small saucepan and place it over medium heat. Bring the mixture to a simmer. Allow it to cook for about 10 minutes, adding a splash of water if it gets too thick. When the tempeh is finished cooking, remove it from the pan, and if needed, deglaze the pan with a bit of water. Wipe out the pan and coat the bottom with the oil. Place the pan over medium heat. When the oil is hot, add the tempeh. Cook for about 5 minutes on each side, until browned and crisp. 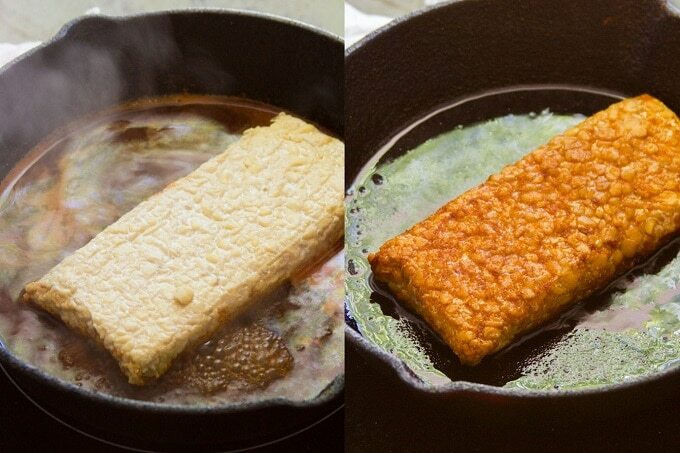 Remove the tempeh from the pan and transfer it to a plate. If you plan on baking your tempeh, preheat the oven to 400°. If you plan on grilling it, oil your grate, light your grill, and build a medium flame. 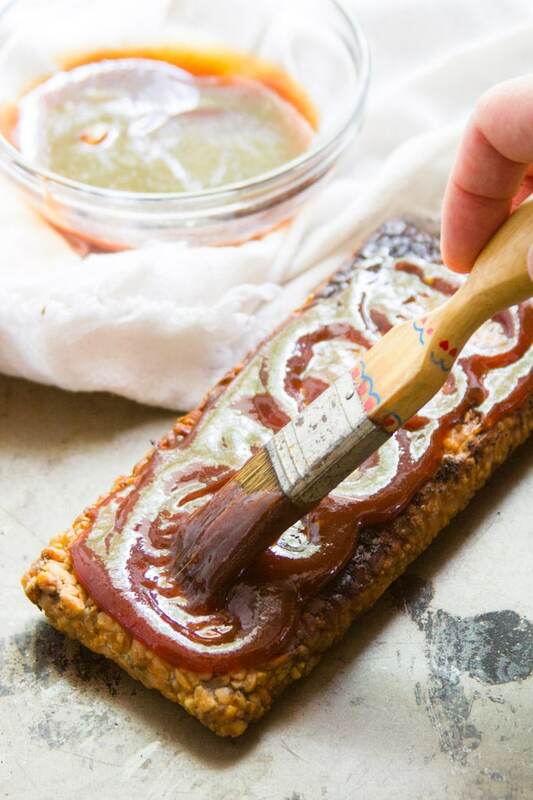 Brush the tempeh with about half of the barbecue sauce. If baking the tempeh, place it on a baking sheet or in an oven safe skillet. Bake for about 10 minutes, until the sauce dries up in spots. If grilling, place the tempeh directly on the grate and grill until lightly charred in spots, about 8 minutes. 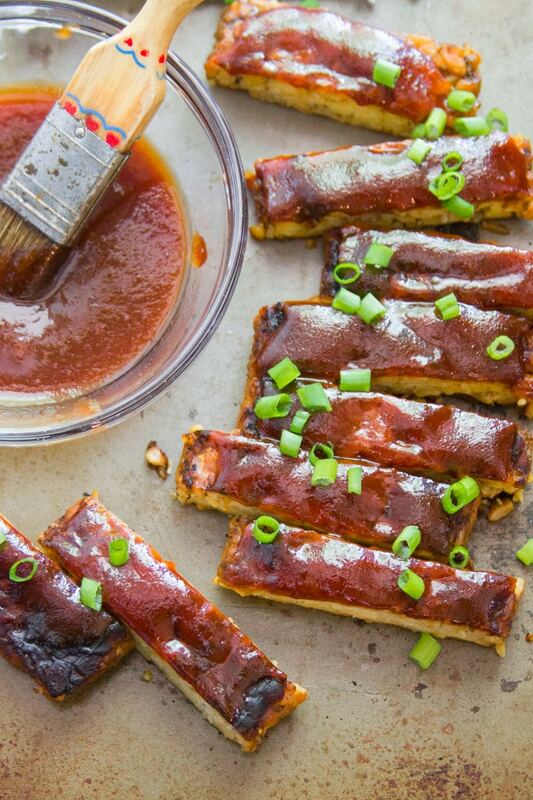 Slice the tempeh into strips and serve with the remaining barbecue sauce on the side. Sprinkle with scallions if you like. I had read this recipe on the internet, made in a restaurant and I would have loved to try it. It was a pleasant surprise to find her here! I’ll try it! Thanks Cristina! I hope you enjoy them! Looks awesome! If I book the tempeh first for 20 mom to get the bitterness out, will it hold up in the pan? I always boil/simmer first. It should! I just gave mine a quick steam in the microwave last time I made this, and it softened it up quite a bit, but it still held up fine. :) Enjoy! I steamed two blocks of tempeh for ten minutes before simmering. They held up fine — no falling apart. Tasty leftovers for lunch tomorrow with cashew-creamed spinach and roasted red potatoes. That sounds like a wonderful lunch! I’m so glad that you like them! Enjoy! I was wondering if I could use firm tofu instead of the tempeh. We don’t have tempeh here. Possibly, but I’m not sure if the braising/frying process (through step 10) would work out very well with tofu. I think you’d be better off marinating the tofu in the soy sauce mixture and then baking it – 30 minutes or so at 400° should do it! Then you can top it with barbecue sauce and either grill or bake it again! I have made these and they are FABULOUS !! Thank you so much for the recipe! Ciabatta rolls are a must for this! Yay!! We actually put the last batch I made on ciabatta rolls and made sandwiches! So funny! Glad you enjoyed them! This was delicious Alissa. Thanks for another great recipe!! Hi Alissa, this is my very first time trying tempeh and I could not be any more pleased! Since life gets in the way, I started the recipe then I had to leave the tempeh sitting in the marinade for two days but I then followed your instructions as written. They turned out fantastic! Thanks for making me a believer in tempeh!